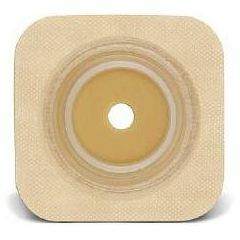 SUR-FIT Natura Durahesive Flexible Skin Barriers are designed for people whose stoma output is mostly liquid. Unlike other skin barrier wafers that can break down around liquid output, Durahesive skin barrier wafers swell up to protect the stoma. This unique effect, called turtle necking, creates a more secure seal without harming the skin. Expensive. ALL ostomy stuff is. Very long lasting. The durahesive material does not shrink and pull away from the stoma like the stomahesive material does. It instead swells up around the stoma and prevents discharge from getting to the skin. I wish I would have figured this out a long time ago......it is making my life a lot easier!